Diwali is in the heart and hearth. An exciting time, we kids felt a special elation if loved ones, family and friends, uncles, aunts and cousins joined us in the celebrations. For that matter, we were always excited to have house guests – everyone (meaning the adults) was on their best behavior and in the most cheerful mood, made plenty of goodies to eat, gave a lot gifts, organised fun activities such as sightseeing – and we got away with taking a lot of liberties that we wouldn’t usually be allowed as parents wouldn’t remonstrate us in the presence of guests. Now that was Diwali of the biggest sort! And when one visits his grown up nephew and niece and their families to celebrate Diwali after decades, it is also Diwali of the biggest sort. Uncle Bakul, our baba’s kid brother visited us last week. A 50th celebration was thrown in as a special feature, but the rest of the time we just vegetated. Uncle Bakul took us all on a happy trip down memory lane, talking about friends, happy memories and sad ones, naughty and funny ones, family dynamics and the analyses of ‘what went wrong’, anecdotes and family fables. Life experiences, lessons learnt wantonly and willy-nilly were shared along with daily routines and current complexities. Years melted away, distance faded, three generations met on level playing field. And can food be far behind? Uncle Bakul’s likes, dislikes and food quirks were fondly revisited. The potatoes that were his staple with the only exception made to ‘binees’ (green beans in Hyderabadi parlance), the thick plain daal that he enjoyed with creamy dahi. He was surprised and delighted that we remembered. When it was my turn to entertain him, I made his favourite ‘Bagharey Baingan’ and was he ecstatic at the rendition, although the slightly seedy versions we accessed in Melbourne were no match to the beautiful, glossy, dark amethyst aubergines in India. But the baghar or ‘tempering’ of zesty spices benevolently closed any and all gaps - as did the Diwali in Melbourne! Baghrey Baingan is a famous Hyderabadi dish, made with the most succulent brinjals in a spicy sauce that reflects the wide-ranging regional influences of Marathwada, Telengana and Karnataka in its unique combination of nuts and seeds of, spices, sweet, savoury, slightly bitter and hot tastes. In my childhood, a typical Hyderabadi menu at weddings and other functions used to have bagharey baingan as their mandatory inclusion along with biryani, baghara bhaat or alu bhaat, mirchi ka salan and dahi ki chutney. Heat the oil in a pan and roast the groundnuts. When lightly browned, add the sesame seeds. When these begin to splutter and puff up, add the khus-khus and cashews. Keep stirring all the time so the nuts/seeds don’t burn. Add the coconut in the end and switch off the heat. Keep stirring the mixture to toast the coconut to a very light brown. Cool the mixture and then grind it with water, making a grainy paste. Prepare the brinjals by washing and quartering them whole, stopping short at the calyx. Don’t remove the calyx and the stem (only if it isn’t thorny). Check the insides of the cuts to ensure there are no hidden surprises there. 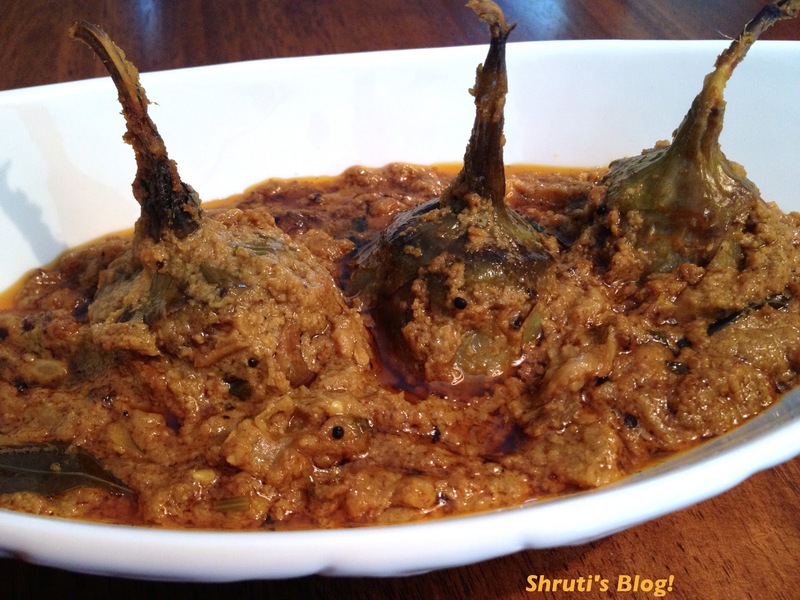 In one Marathi version, these slit brinjals are stuffed and cooked on slow fire. But in this version, they are deep or shallow fried till half done in oil. Heat about one cup of oil in a heavy flat-bottomed pan and shallow fry the brinjals. Turn them around gently to ensure uniform frying, but let them cook only half way through. Drain and keep the brinjals aside. In the same pan, make sure there is enough oil remaining to fry the onion and masalas and brinjals, usually about 3-4 tbsp. Add the mustard seeds, dry whole spices and let them splutter. Add the curry leaves, green chillies and chopped onions and sauté for a minute. Add the garlic and ginger paste and sauté further and add the methi powder, hing and turmeric. Then add the gravy mixture and stir well. Make sure there is enough water to cook the gravy without burning. Add all the powders, including the garam masala and red chilli powder. Let the mixture boil on medium heat for about 10 minutes stirring from time to time and then add the tamarind paste and jaggery and salt. Check the taste, adjust according to your taste and let the mixture cook a little more, till you see the oil separating from the gravy. Now reduce the heat and gently lower the half-cooked/fried brinjals into the gravy, holding them by the stems. Cook the brinjals in the gravy without disturbing them much. The brinjals will release some oil. their Check if the brinjals are done, usually takes about 7-10 minutes, depending on the quality of the brinjals. You will also need to decide how thick you want the gravy to be. Remember the gravy thickens when cooled slightly, so make allowance for serving time and resting time. Let the dish rest covered for a while and garnish with chopped coriander before serving it hot with biryani or plain rice or rotis of any description. This gravy can be used to make another popular Hyderabadi dish – Mirchi ka Salan as well. This is amazing Shruti - as usual. You have been so effusive and garnished with thoughts about our memories even in the Bagharey Baigan presentation. Aww, Bakul- we loved having you over! Do come back soon- this time with Corrinne! Awesome, will try this recipe soon. Thanks, Akshaya! Do let me know how it turns out for you! 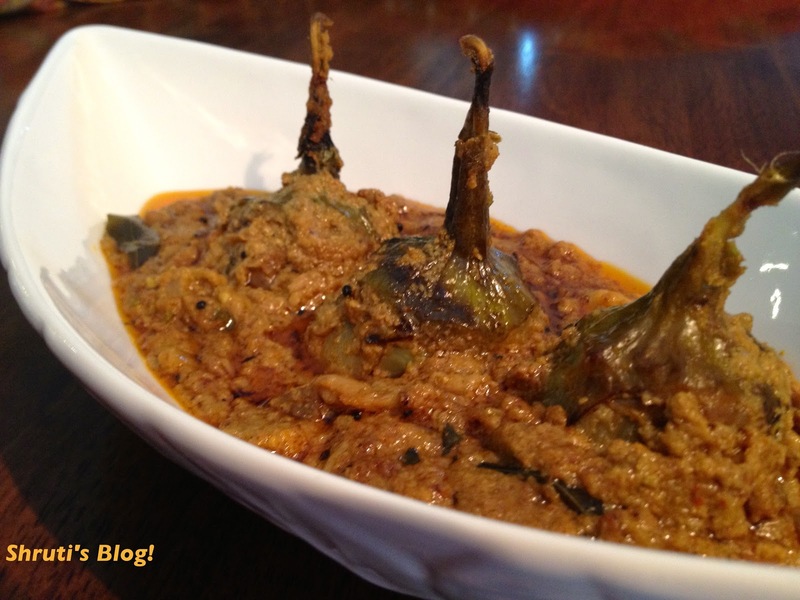 You could also use this gravy and technique with banana chillies to make a Hyderabadi Mirchi ka Salan!